Avebury Stone #46 Marks the Swan and the Eagle in the Stars on its "Cygnus Side"
Avebury Stone #46, also known as the "Swindon Stone", is the most northerly stone in the Northwest Sector of Avebury Henge and is placed here in our analysis directly after Avebury Stone #30, just previously deciphered, which is the most southerly stone in the Northwest Sector of Avebury Henge. Contrary to our routine start with the henge-outward face of a stone, here we start with what we call the "Cygnus Side" of Avebury Stone #46, a side which marks stars in the Swan of Cygnus and under it the Eagle of Aquila. Lyra is also marked -- to the side of the head of the Swan. Avebury Stone #46 is a gigantic megalith -- the largest in terms of weight of all the Avebury Henge stones. It is one of the most famous stones at Avebury. 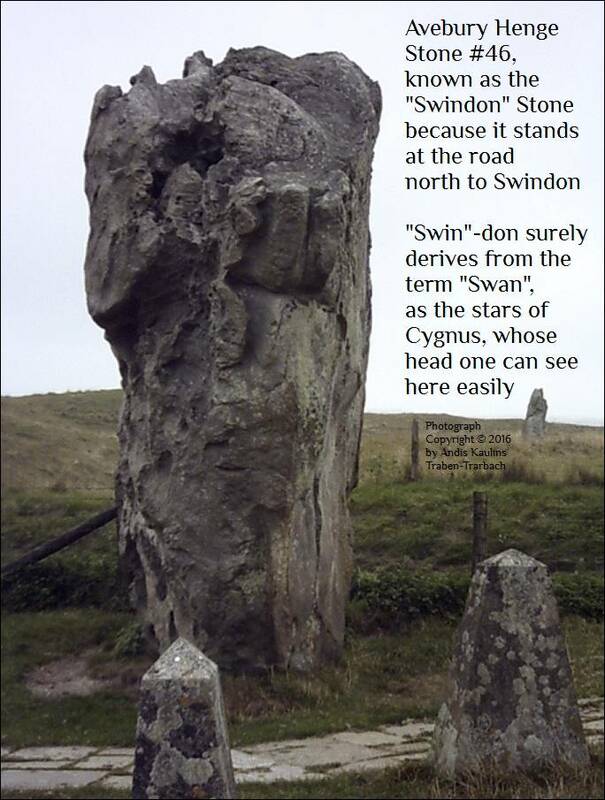 We begin with this side of the stone because we think it possible that its name as the "Swindon Stone" has not only to do with the fact that it marks the gateway to the town of Swindon to its north, but also because "Swin"-don itself may have been named for the "Swan" that the Swindon Stone represents, i.e. an original name perhaps something like Swan-don, Swan-ton, Swan-down, or Swan-town. The Domesday Book spelled its name as Suindune. The folk etymology that this derived from "swine" appears to us to be just idle nonsense. The closest Roman name for a town nearby was Durocornovium ("door of the horn"), thought to be the village of Wanborough, i.e. "WAN-borough", so that an original (S)WAN-borough is remotely possible. On the other hand, we find written at the Wikipedia that Wanborough was recorded in the Anglo-Saxon Chronicle as Wôdnes-beorg which later became Wodnesborough before becoming Wanborough, in which case the "Swan" name origin is less likely. However, Joseph Bosworth's A Dictionary of the Anglo-Saxon Language equates Wodnes with the Germanic god Woden, i.e. Odin, and so arguably takes Avebury into the astronomical world of ancient gods in any case. 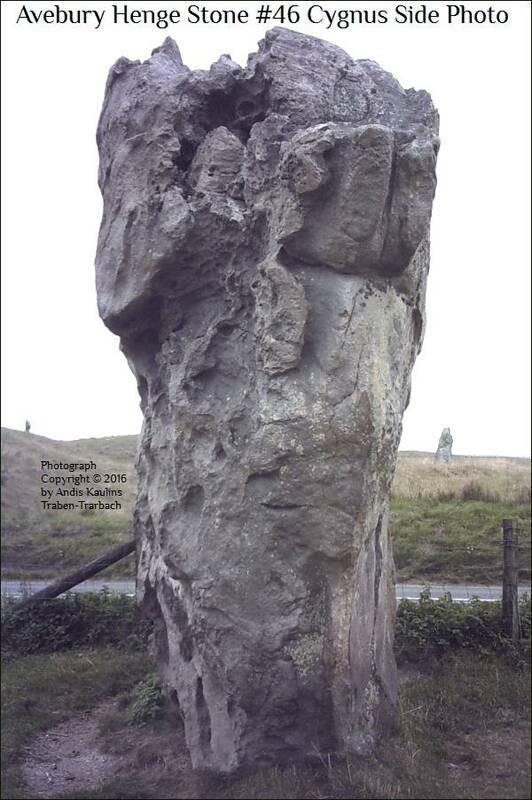 We will show in subsequent postings that the henge-inward face of Avebury Stone #46 includes the stars of mid-heaven. The Wikipedia writes about Odin: "Odin was known in Old English as Wōden, in Old Saxon as Wōdan, and in Old High German as Wuotan or Wōtan, all stemming from the reconstructed Proto-Germanic theonym wōđanaz." The proto-Indo-European term on the basis of Latvian vidiens (compare wōđanaz), could simply have meant "middle, center, main". We need not trace here the principal markings on this stone because both the swan and the eagle are easy to spot on the stone. There are other figures on the stone of course, but these merely add detail to the main analysis, e.g. the typical "back" of the swan at the top of the stone (visible only on the second photograph below). 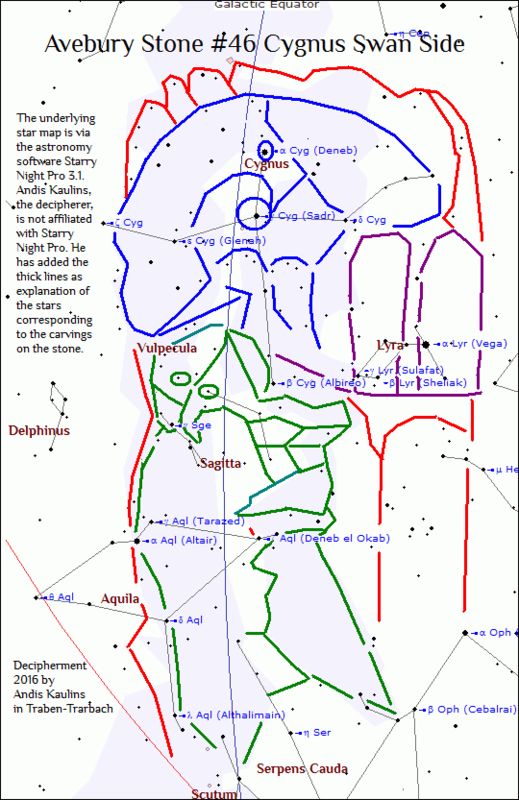 Our photographs below are followed by our decipherment image of the corresponding stars, drawing the main carvings on the stone on an underlying map of the stars clipped via Starry Night Pro astronomy software. Obviously then, all of the other faces and sides of Avebury Stone #46 must by the logic of our other Avebury decipherments then mark neighboring stars. We now look at the henge-inward and henge outward faces of the stone. Please note: We do not have a photograph of the opposite narrow side of the Swindon Stone because there was a limiting fence on location there and that side of the stone jutted out toward the road over that fence, so that we were unable to make a photograph of that side. If someone out there has or knows where to find a photograph of that opposite side, please let us know, as we would be pleased to add that side to our decipherments. We have found no such photograph online and find none in our personal library of Avebury books. Thank you.